League of Legends (LoL) is currently the world’s most played video game, and with its highly competitive gameplay it is one of the main platforms for the quickly growing and popular phenomenon “e-sport”. More than 35 million people play League of Legends on a regular basis, and many newcomers join the battle every day. The main reasons for its popularity is that League of Legends is completely free to play and easy to get caught up in because of the the action packed battles, which has big emphasis on rewarding teamwork. Here you will find the most important tips on how to get a good start in League of Legends, as well 3 simple steps on how to get ready for your first battle. Launch LoL to get the latest update and log in to start playing! Keep reading for some tips that will get you started, make you win more games and teach you the most important basics. League of Legends is of the “MOBA” (Multiplayer Online Battle Arena) genre and has a concept similar to games like DOTA, DOTA2 and Heroes of Newerth. If you have played any other MOBA before, you will feel comfortable with League of Legends in no time. Several other popular game types like “Dominion” and “ARAM” (All Random All Mid) are also popular but will not be covered in this guide. Once you have selected a game mode you will have the option to either invite teammates from your own friend-list, or have the system automatically match you with other League of Legends players with approximately the same skill level as yourself. Keep in mind that if you team up with a friend who is very experienced you will probably be matched against a team with enemy players of his/her skill level. After a few minutes of waiting in the queue you will get the option to join a game and then select a champion you want to play. It is you as a “summoner” who level up as you get experience points, not your individual champions. Thus, the only advantage you will achieve by playing the same champion often is to get more comfortable with the skill set and mechanics of that champion. A good team composition is essential for winning games, so talk with your team in the chat before you select a champion, and agree on what will be your main task in this game. When you know your role it is much easier to select a champion suitable for the job. When everyone has selected a champion and two summoners spells, the game starts. Each game usually takes 30-45 minutes, which is until either one team destroys the other team’s Nexus (main base) or until one team choose to surrender (by popular vote). The goal in League of Legends is to protect your main base by defending three lanes where AI controlled minions from both sides will be in constant battle. By assisting your own minions you will be able to push forward towards several towers along the lanes, and in time be able to deal enough damage to destroy them and continue pushing towards the enemy Nexus ( be careful not to get hit by the towers yourself! A good rule of thumb is to approach a tower only when it is busy targeting minions instead of you). As the game progresses, you will earn gold by killing minions, monsters and enemy players, which can be spend on items back in the shop behind your Nexus. Once you have collected enough gold to buy the item you want, press B to “recall” and go back to the shop where you can spend your gold. In League of Legends, everything you buy will be kept only for this single game, as everyone starts with no items at the beginning of each match. If you are not sure which items to buy, it is generally a good idea to go with the recommended ones. These will change depending on which champion you are currently playing, and will boost your powers the right way. Once you get more experienced, you will learn that it is important to adapt your item selection depending on which champions and items your enemy team has chosen. If you are looking for new ideas on how to build your champions, a good place to start is over at MobaFire where players can share their favorite builds and get inspired by others. During the game you will rise in levels from 1 to 18 and thereby gain and upgrade the “abilities” of your champion. All League of Legends champions have 5 abilities, 1 passive and 4 which usually have to be activated by you. The four active abilities are mapped to the keyboard buttons Q, W, E and R, making them easily accessible. League of Legends has a concept where the R ability is the “Ultimate” ability for all champions, which means that it is so powerful that it will often give your team a great advantage when used. A rule of thumb is to save your ultimate ability to a time where it can have considerable impact, as it will usually have a cool down of several minutes before it is ready to be used again. There are more than 100 different champions to choose from in League of Legends, and more are added on a regular basis. New players will be able to choose between 10 of these champions (which 10 changes every week), allowing you to try out different ones to see which is the better match for your preferred play style. Winning games in League of Legends will earn you IP (Influence Points) which can then be used to unlock your favorite champions for good, so you can play them regardless of whether they are part of the current 10 free champions. If you cannot wait, it is possible to purchase RP (Riot Points) for real money, which will unlock champions as well as alternative skins that changes the look of your character. It is important to notice that no in-game advantage can be bought in League of Legends, which is important for competitive games! If you could just buy your way to an unfair advantage over others, it would be devastating for the competitive play. 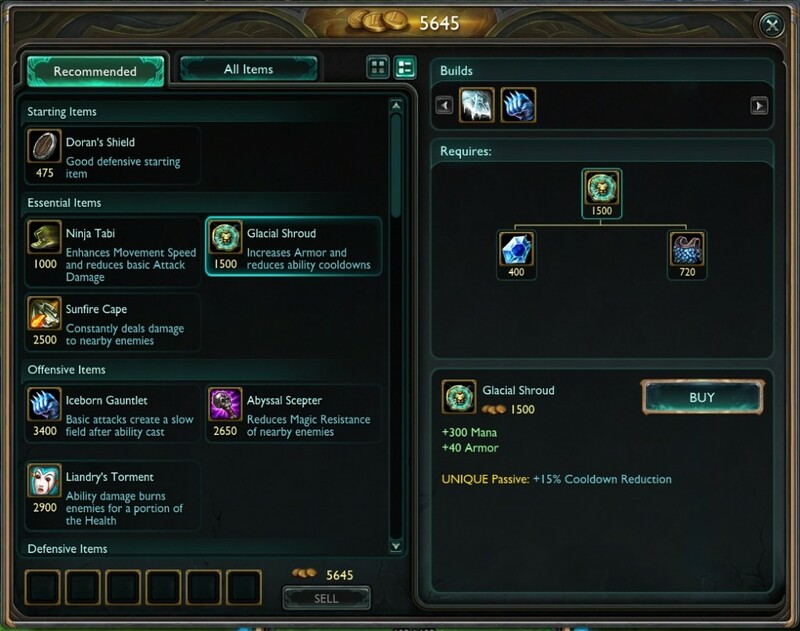 In addition to unlocking champions, IP can also be used for buying runes which you can use to slightly improve certain offensive or defensive capabilities of your champion. As you achieve a higher summoner level (1-30) you will also be able to spend talent points in a tree structure. Once you reach level 30 you will be able to start playing competitive games in the official tournament. It takes a lot of experience to be very good at League of Legends, but by following some very simple basic rules you will be able to do good right from the start. Plan the selection of champions with your team, as well as who has which role. Try to kill players from the enemy team, but be careful not to die yourself. Help your teammates whenever you can. If they die, you will be at a disadvantage as well. Focus on “last hitting” enemy minions. You only earn the gold if you deliver the final blow. If you get very low on health, recall back to your base to get healed up. Keep a positive tone in the chat, and encourage your team mates by giving constructive feedback and advise when they do something good or bad. Being too close to enemy towers, when they are not busy shooting at your minions. Taking out your frustration on your team mates, when someone makes a mistake. It lowers the morale and has been proved to result in fewer won games. With this overview, you should be able to get a good start in League of Legends. As you get more experienced, you will of course need to go into detail with the individual elements of the game. Good luck on the fields of justice! I hope that you will have a lot of fun playing League of Legends! Feel free to write a comment below if you feel like sharing your experience with the game, if you are looking for a team to play with, or anything other related to League of Legends. By Mikkel at March 26, 2015 . I don’t own the rights for it, but I am convinced that Riot Games won’t have any problem with you hanging a giant print out on your wall. You will, however, need the full resolution one, which can be found here. Hey, I really love this article. My question is, where’d u get the summoner’s rift birds eye view art??? I can’t find a high definition version, and i honestly want one for CrystalScar HowlingAbyss and TwistedTreeline. So if you could perhaps send me the link or something i would freaky appreciate it. Its only the very basics of League of Legends, but its What I would have liked to know myself, when I first started playing. 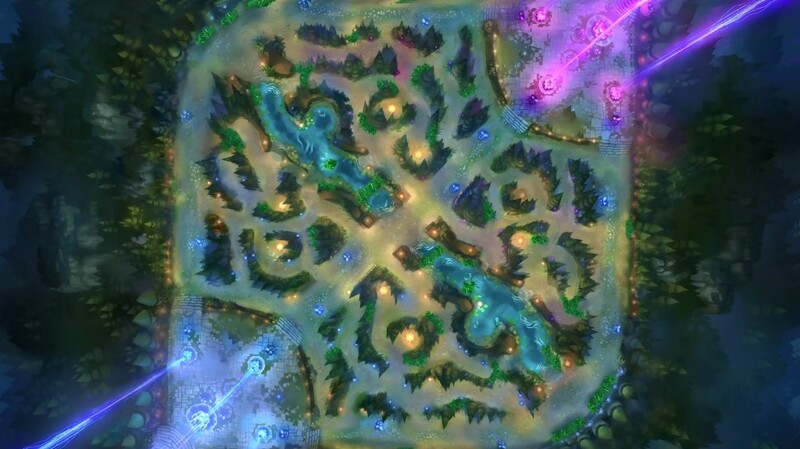 You can get the full high res version by clicking on the scaled down Summoner’s Rift map in the article. Good read! It’s the stuff more people should do and the community would definitely get better! I wanted to know if i could use the overview image of the rift for a university work? I’ll reference the page of course, but i always like to have the rights to use a picture i didn’t take myself. And about that, how did you take that shot? It’s really nice! Awesome to hear that you find my small LoL guide useful. The overview image of Summoner’s Rift is not a screenshot but a piece of concept art. Unfortunately (and kinda embarrassingly) I cannot name you the original artist at this point. I do not own the rights for the artwork, and should thus link to, or at least mention, the original artist and owner. I think that I originally found it in a League of Legends wiki somewhere, without a source. I will keep searching for the original source, and of course update as soon as I find it. Good luck with your uni. project.